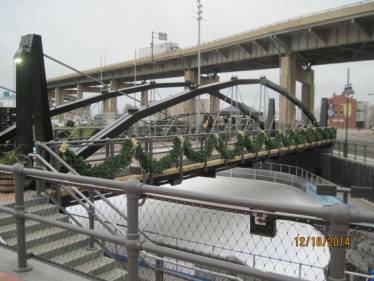 The Buffalo Inner Harbor project is an ongoing revitalization effort along Buffalo’s inner harbor waterfront which incorporates many historic elements of the original Erie Canal and pays tribute to Buffalo’s role as the important western terminus of the canal. The latest portion of this revitalization effort is the $23 million dollar Canalside development which involved the construction of 37,000 square feet of canals which will double as ice skating paths during the winter, as well as 22,000 square feet of pedestrian walkways, and three pedestrian bridges to traverse the canals. These bridges were constructed with modern materials, but resembling a bridge style popular in the 1800s when the canal was built, known as the “Whipple Bridge.” The Whipple Bridge design is easily recognizable by the dual iron arches which support numerous tie rods that crisscross through the bridge deck to the bottom chords. Two of the three pedestrian bridges would also have Swartz end posts braced with long suspension rods for added stability. 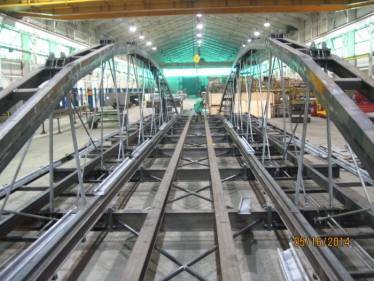 In 2012, the company selected to fabricate the three bridges came to Portland Bolt. 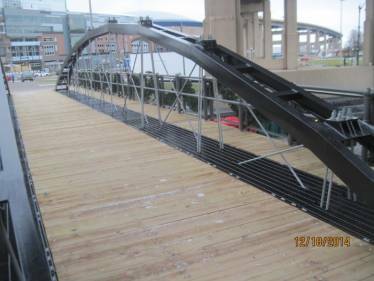 With the complexity of the design and the large quantities of galvanized Grade 55 tie rod assemblies on the three structures, the contractor knew they needed to take the project to a company they could trust to manufacture the correct parts. In one month’s time, Portland Bolt was able to manufacture, galvanize, test fit, and ship over 14,000 pounds of ASTM F1554 Grade 55 tie rod and suspension rod assemblies to the fabricator in New York. The 1” diameter tie rods ranged from 5’ to 17’ in length and the suspension rods were 1-1/2” diameter ranging from 27’ to 32’ in length. Our in-house galvanizing line allowed us the quality control to ensure that the long rods had clean, useable threads that would have a trouble-free fit in the field. If you have a project with tie rod assemblies, contact one of our experienced estimators today. With 156 years of combined industry experience in our sales office, handy tools like our tie rod calculator, and our reputation for great customer service, we can help you ensure that your project will get the correct fasteners in the time frame you need!